Trump leaving it up to the states to decide whether to legalize marijuana, has now paved the way to it becoming a reality! 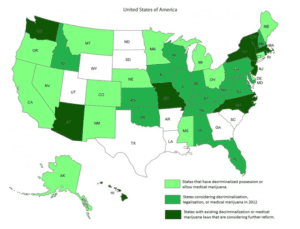 Although 25 states already legalized marijuana for medical usage only 4 have allowed it to be legal for recreational use, but Proposition 64, which would allow adults who are 21 and older to possess, transport, purchase and use up to 1oz of cannabis for recreational purposes and also allow individuals to grow up to 6 plants. Since yesterday we have seen this proposition being triggered already in California , with more states to surely follow as this really made a statement as Cali has a huge population with 38 million residents and is the state with the largest economy. It should be noted that in Colorado for example during 2015 $120 million tax revenue was injected from nearly $1 Billion of medical marijuana sales, leading to $2.39 Billion of economic impact by the creation of 18,000 new jobs, business to business transactions and also indirect creation of jobs. Currently in California tax revenue from Medical sales of Marijuana are going to a special fund, $10 Million distributed to organizations in communities that are strongly affected by the prohibition/drug war such as South Central, Oakland and Barrio Logan, another $10 Million goes to Universities for Marijuana research, 60% of the remaining funds go to education of youths, prevention, drug treatment and job placement assistance, 20% goes to law enforcement and the last 20% to environmental protection. Creation of rules and policies to ensure people are not driving whilst under the influence. Imposing the 15% sales tax on Marijuana retail. 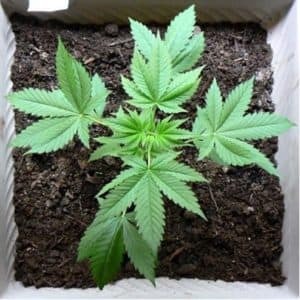 Jacob Rowberry an associate of the Marijuana Policy Group stated that legalization of the ballot would result in similar laws that governalcohol use, such as anyone older than 21 would be able to own small amounts of marijuana and be allowed to grow Marijuana plants in their homes. Business would need to get proper licenses in order to sell and distribute, and also tax revenue would be carefully allocated to fund various state programs. It is noteworthy that states do vary on possession amounts as well as tax revenue and criminal enforcement and these are decided on a local level by the state. 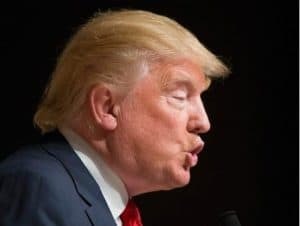 Donald Trumps standpoint has been that it is a “state by state issue” and therefore the ultimate decision must be made by the state themselves. Up to 60% of Americans now support the usage of marijuana Seeds which has risen considerably since 2000 where it was as low as 31%. It will create a safe and legal comprehensive system for Marijuana use. Legalization will ensure that it is available with protection of product safety whilst generating tax for the state. The proposition will abolish the criminalization of adult responsible usage. The new law will incorporate the best practices that are already in place by states that already legalized adult marijuana usage which adheres closely to recommendations of the Blue Ribbon Commission in California, which includes law enforcement and public safety. Allows growing near schools and parks. Feared increase of black market and drug cartel activity. Possible roll back of total prohibition of smoking advertisements on TV. ‘Assault’ on underprivileged neighborhoods that already reel from dug and alcohol addiction problems. And no, you still cant get high at work in California! Recreational use will be legal but employers will surely prohibit possession, using and being under the influence of Marijuana at work, this has been spelled out clearly in the proposition but not in the ballot summary that most people will be reading!